Flood insurance covers direct physical loss caused by “flood.” In simple terms, a flood is an excess of water on land that is normally dry. Here’s the official definition used by the National Flood Insurance Program. *Mudflow is defined as “A river of liquid and flowing mud on the surfaces of normally dry land areas, as when earth is carried by a current of water. A Standard Flood Insurance Policy is a single-peril (flood) policy that pays for direct physical damage to your insured property up to the replacement cost or Actual Cash Value (ACV) (See “How Flood Damages Are Valued”) of the actual damages or the policy limit of liability, whichever is less. Contents coverage must be purchased separately. It is not a valued policy. A valued policy pays the limit of liability in the event of a total loss. For example: Your home is totally destroyed by a fire and it costs $150,000 to rebuild. If your homeowners insurance policy is a valued policy with a $200,000 limit of liability on the building, you would receive $200,000. 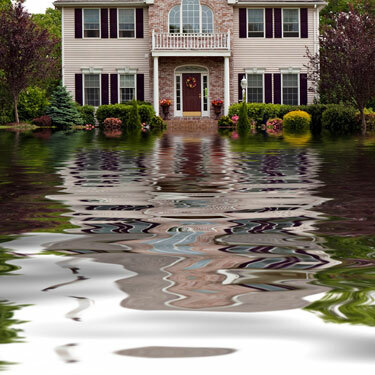 Flood insurance pays just the replacement cost or ACV of actual damages, up to the policy limit. It is not a guaranteed replacement cost policy. A guaranteed replacement cost policy pays the cost to rebuild your home regardless of the limit of liability. For example: Your home is totally destroyed by a fire and it costs $200,000 to rebuild. If your homeowners insurance policy is a guaranteed replacement cost policy with a $150,000 limit of liability on the building, you would receive $200,000. Flood insurance does not pay more than the policy limit. Generally, physical damage to your building or personal property “directly” caused by a flood is covered by your flood insurance policy. For example, damages caused by a sewer backup are covered if the backup is a direct result of flooding. However, if the backup is caused by some other problem, the damages are not covered.